The day after returning from the conference I started the first day of my new job. It was a bit crazy but I wanted to jump right in because I was absolutely broke! You won’t guess where I got a new job! Philip Beesley Architect! That’s right, I went back… yet again (this is the third time). This time though it is for an entirely different role. Philip Beesley is partnering with an Austrian architect, Rolf Siefert who is working on a few building projects in Toronto. The main one that is well underway is a renovation and addition to an old industrial building in Liberty Village. The building has a lot of character and it has been challenging and fun to work on! I have been a few times on site and felt like, yes, this is what I’m supposed to be doing! Remind me.. why did it take so long to get to this point? I am now in the intern architect program and have started logging my hours to become a certified, full-fledged architect! Only two-ish more years to go (that is if I am ultra efficient)! 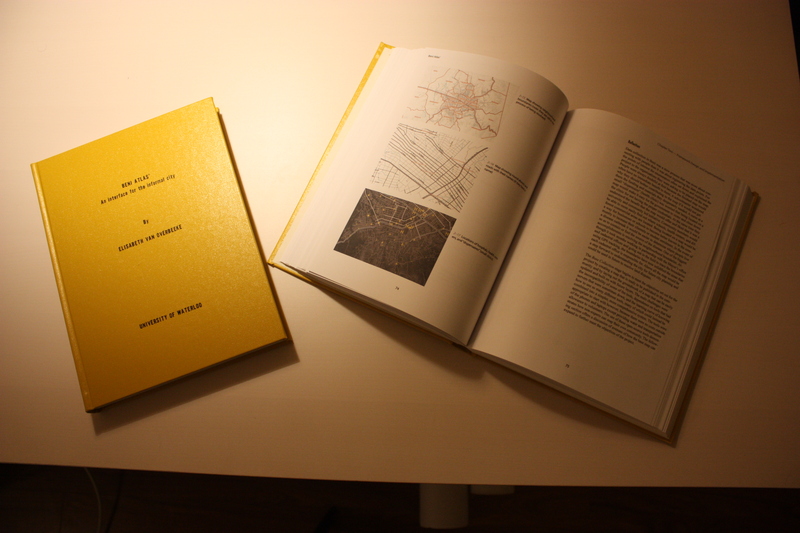 Another fun moment was getting my bound theses from the school! What? I wrote a one inch thick book? Okay, that must mean I can do anything I put my mind to (with God’s strength and direction)! Because I was working in the West end, I had a real desire to move back there and be closer to my job. Where I was renting a room from John-Paul in the East end it took me an hour to get to and from work and I felt distant from the architecture community. I had previously lived for a year in little Portugal and eight months in the Junction triangle and so the area already felt like home. My friend Jen from Grace Toronto knew that I was looking for a place and wanted to introduce me to a girl from our church named Susan who was looking in the same area. It seemed like we would get along great and so we started looking for a place together. It was an exhausting process but we found a place a few weeks later! It’s the biggest place I’ve ever had! 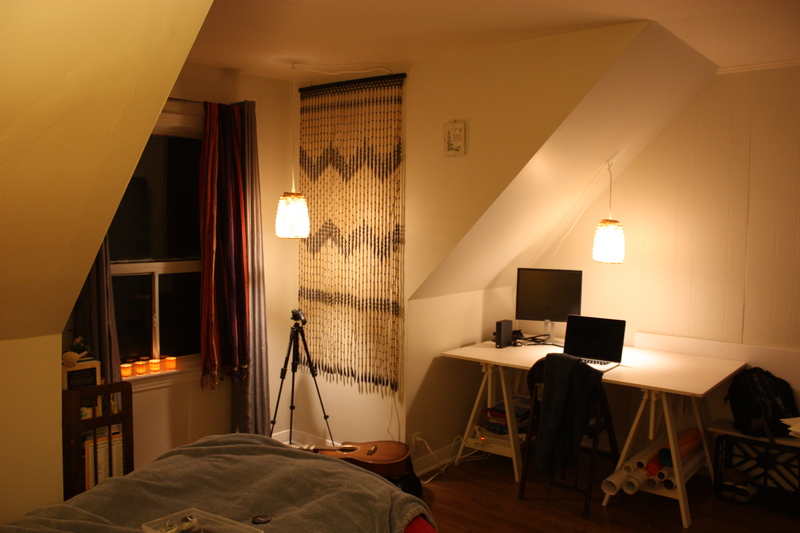 Sometimes I feel like it is more space then I need, but then I think of how nice it is to host people and work on crafty projects :P. The apartment is in the Junction neighbourhood and is the second and third floors of a house. The kitchen, dining, and living rooms are on the main floor and the bedrooms are on the upper floor. The apartment is a perfect twenty minute walk away from my work and a skip and a jump from High Park! 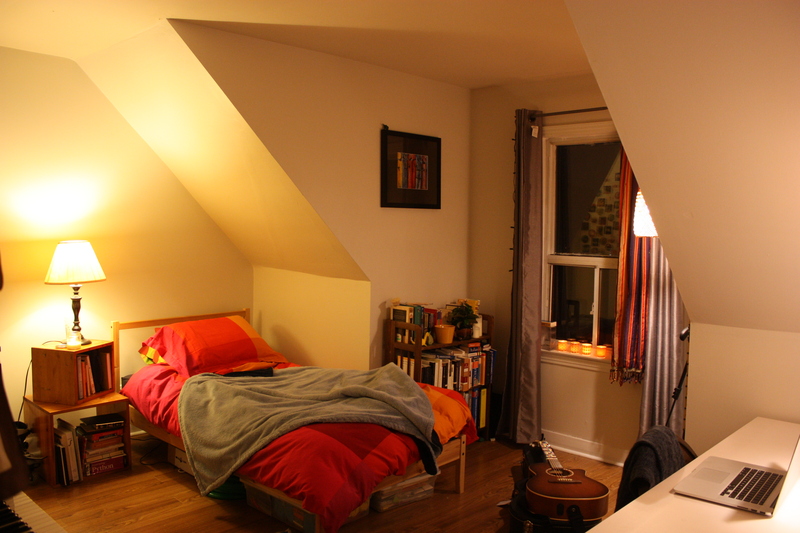 Because the apartment is so spacious I think it is going to take a while for us to get it looking the way we want, but I have managed to make my room into a welcoming, gezellig space. I might save photos of the living areas for another day when I am more proud of what they look like! For now though, here is a project that I did last weekend. Susan has a wicked road bike that she keeps inside and we were trying to think of a cool place to put it. We have a very generous stairway and so I thought it would be cool to hang it off the wall there. I went into a bike shop looking for wall hooks and found out that they are expensive, but then I was inspired by bikes that were on display that were sitting on a sloped rack and held from behind with a single hook. I realised that this would work in our entry on a small little sloped area that runs beside the stairs and would only cost me a few dollars! The result is that when you enter our apartment, you feel like you are about to be run down by a bike! 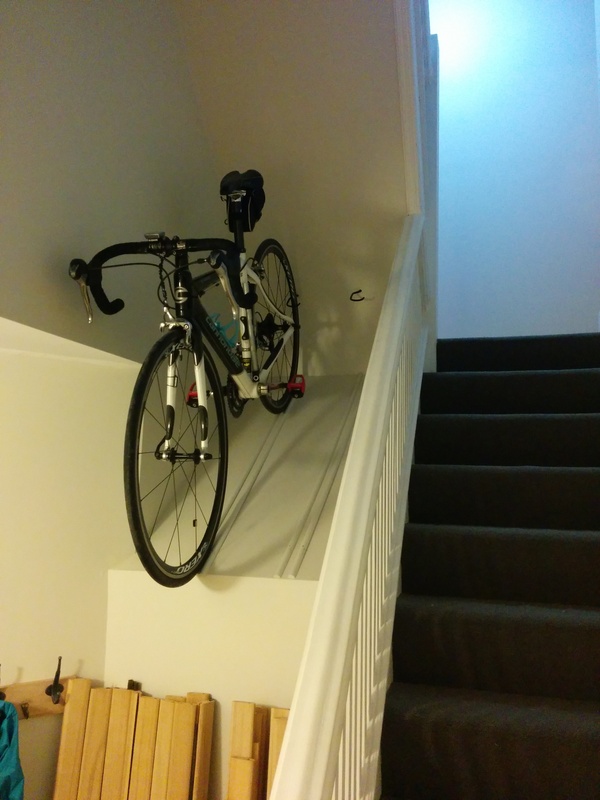 I put two hooks in so that my future nice bike (one day…) will also have a home…. :P There will be many more house projects yet to come! From the London Eye I began going down Queens Walk that is a lovely walkway right alongside the river. One thing that impresses me about London is the infrastructure and how it is celebrated. I liked one walking bridge in particular called the Golden Jubilee Bridge because it borrowed its structure from the bridge next to it. The Queens Walk was lively because it was a beautiful day. There were buskers, and people blowing bubbles for a group of kids, and a skate park that was incorporated into a building. 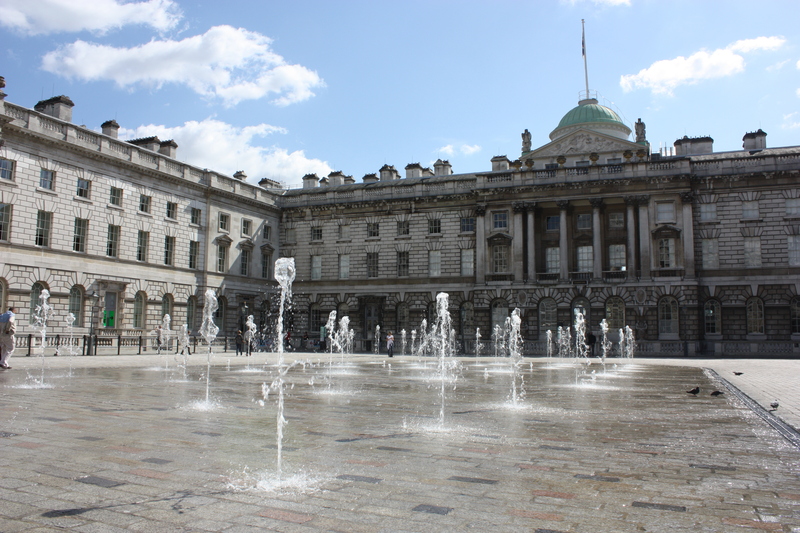 I walked along the south shore of the Thames and crossed at Waterloo Bridge to get to my next destination that was Somerset House. The main reason I wanted to see it was to experience the courtyard that has 55 dancing fountains that are incorporated seamlessly between cobblestones that match the historic neoclassical facade. It was as beautiful as I thought it would be! I learned that in the winter they transform the square into a public ice rink. From there I walked down Strand, Fleet Street, and then Ludgate Hill until I reached St. Paul’s Cathedral. 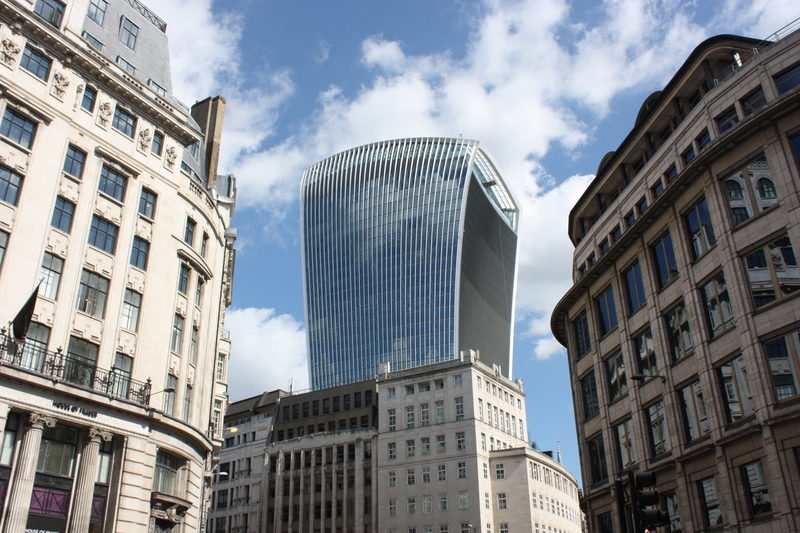 On my way there I got my first view of this well known monstrosity: 20 Fenchurch Street or more commonly known as the “Walkie Talkie” designed by architect Rafael Viñoly. Instead of tapering like most towers, it bulges at the top to have more prime real-estate on the top floors. My friend told me that the curved glass acted like a heat ray and scorched some tarmac and cars before they decided to solve it by putting fins on the building. Saint Paul’s Cathedral is a beautiful church. Unfortunately I couldn’t see much of it because a service was in session. I was in a hurry anyways because I had arranged to meet a friend for lunch. I met my friend Vikash at the south end of London Bridge. On the way to meeting him I got my first glimpse of the Shard by Renzo Piano and the Gherkin by Foster and Partners, towers that are much more pleasing to the eye than the Walkie Talkie! From London Bridge there is also a great view to the Tower Bridge. For some reason I always thought that the Tower Bridge was the London Bridge from the nursary rhyme, but there used to be an old London Bridge where the new one is now that had small arches and clusters of buildings along its length. I found Vikash and he took me through the Burroughs market. It too was vacant (Sundays… *sigh*) so we went to a bar that overlooks the Thames. I know Vikash from hosting him for two weeks at my place in Cambridge when he came to the ACADIA conference with a team from the University of Nottingham. We had a fun time catching up and talking architecture. After we finished our pints we decided to walk around. I told him that there were three more places I wanted to see: this random bakery called St. John Bakery that I read has the best donuts in the city, the base of the Shard tower, and Tate Modern. So off we went first to find the bakery. 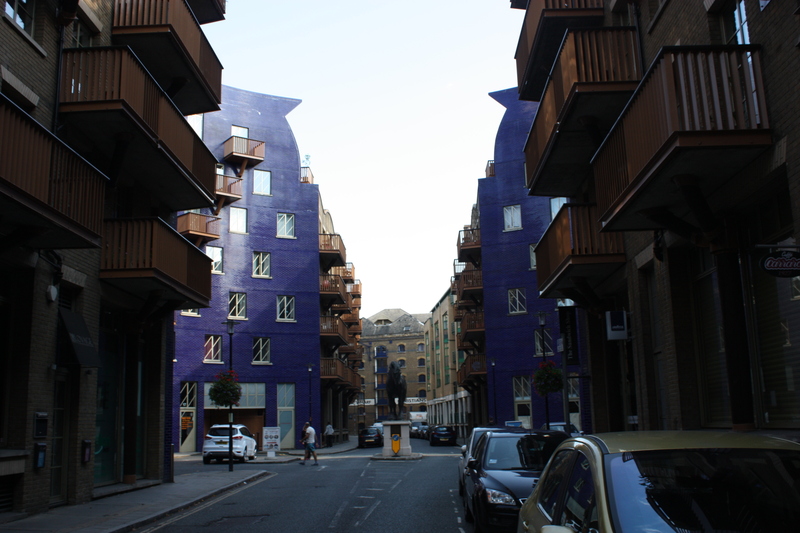 I brought us a weird way to get there and it was interesting to see a more residential part of central London. There are a lot of industrial buildings that have been turned into flats. We also happened across a bizarre circular intersection where the apartments that bordered it were rounded with the circle and were covered in royal blue tile. We decided it was the strangest thing we had ever seen and didn’t know what to make of it. Vikash had to chuckle because it goes to show there is always something new to discover in a city. The St. John’s Bakery was located in an interesting area where there are stores and shops that are built underneath a set of arches that carry the train tracks. At first we were confused because we had approached the strip from the backside. When we found our way under to the other side, we discovered a vibrant little food market area called the Rope Walk. The bakery was under one of the arches and there were other permanent and pop-up food places as well. It was such a cool find! One of the archways was full of stacked lumber and there were people there grilling gourmet burgers! We were very hungry by that time and so we decided we were going to get burgers, but when I reached into my purse, my little satchel that held my cash and credit cards was nowhere to be found! I was so discouraged and embarassed. We decided to skip lunch, got the donuts we had come all that way for, and retraced our steps. We didn’t find it, but I decided that we might as well not let it completely ruin the afternoon. 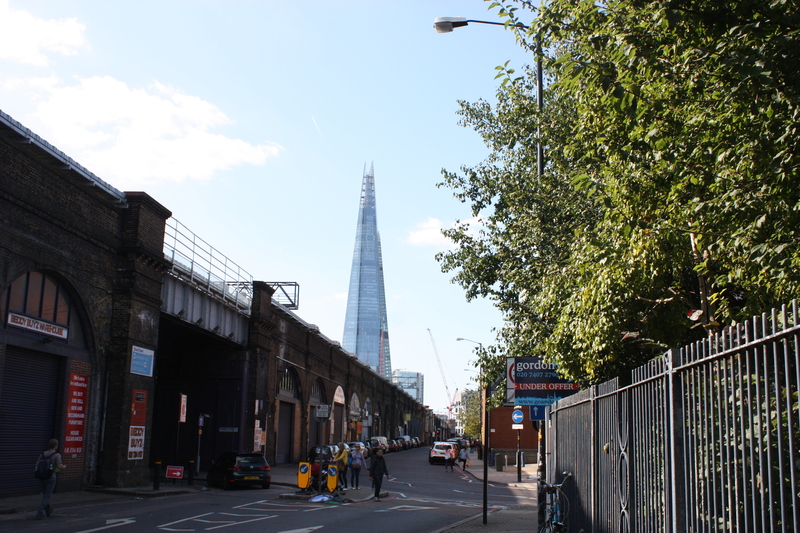 We still went to the base of the Shard (I was disappointed… I don’t think Piano achieved his original vision) and Tate Modern before parting ways. 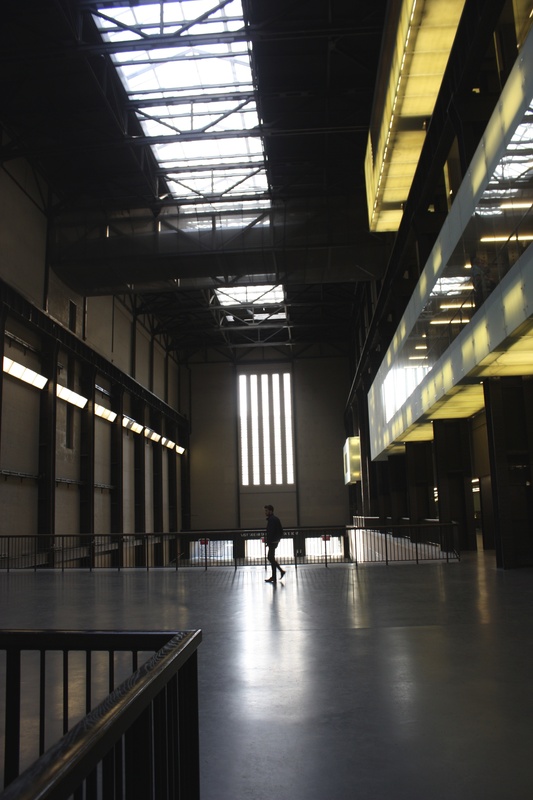 The Tate was another great building to see! It is inside of a former power station and architects Herzog and de Meuron designed the adaptive reuse. Across from the Tate is the Millennium pedestrian bridge, another beautiful piece of infrastructure. 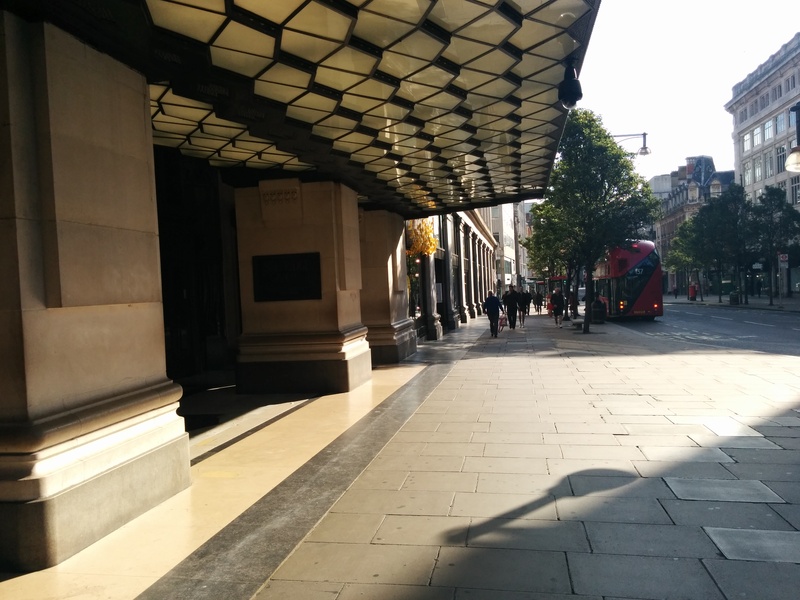 London is such an inspiring collection of old and new architecture that is widely distributed throughout the city! I was very fortunate to have just enough Canadian money left in my purse to get me to the airport the next day. Because I had to save it for that particular trip I had to walk alllll the way back to Kensington. It was a just punishment. I must have walked well over thirty kilometres that day and therefore was not a particularly fun journey home. My phone had also died by that point and so I was finding my way back from memory and made a few accidental detours along the way. Once I arrived back at the hostel I bought another tiny snacky meal from the grocery store and then began packing my bags. I decided to go to the airport that night instead of the next morning because I didn’t have any extra money for contingency if for some reason there was a delay on the underground. At the airport I found myself a little spot between a column and the facade, pulled out my sleeping bag and slept a fitful four or five hours on the hard floor! And that brings me to the end of another adventure! I definitely need to spend more time in London, but I think I did pretty well for only one day! The reason why the title of the post is called “London by Day” is because I had only been to London once before when I saw it by night during a sixteen hour layover back in 2012. This time I did not arrange to couch surf in London because I had intended on staying with people I knew. However, my arrangements fell through and so I booked a hostel called Londonears that Alice had recommended. Upon arriving at Waterloo Station I immediately made my way on the Underground to a station called Earl’s Court in Kensington. I walk out of the station and what is standing in front of me? A TARDIS! It pretty much made my day. Because I didn’t arrive there until early evening, I went for a walk around the neighbourhood, bought a snacky dinner from the grocery store, and hung out at the hostel. This hostel was crazy cheap (eleven pounds per night), but not nearly as charming as the one in Exeter. I spent the evening figuring out what I would try to see the next day. The following day I woke up early and began my journey to see London. I decided to see it on foot by walking from Kensington, which is in the West, all the way to the East side and then take the Underground back. I decided to see London this way because, even though the destinations are great, I enjoy the surprises that you come across in between. I actually got my fair share of those! 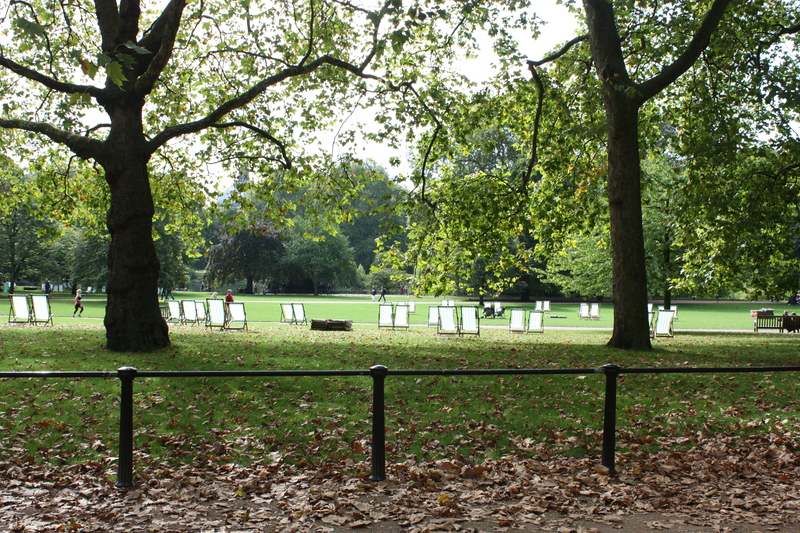 I started my journey by walking up to Hyde Park. What an amaaazing park. I was there as the sun was rising and it was just me, nature, and a few joggers and cyclists. I loved the axial cuts through the landscape and the clusters of wooded areas. I liked how empty it was because I find that in Toronto parks we tend to over-program. 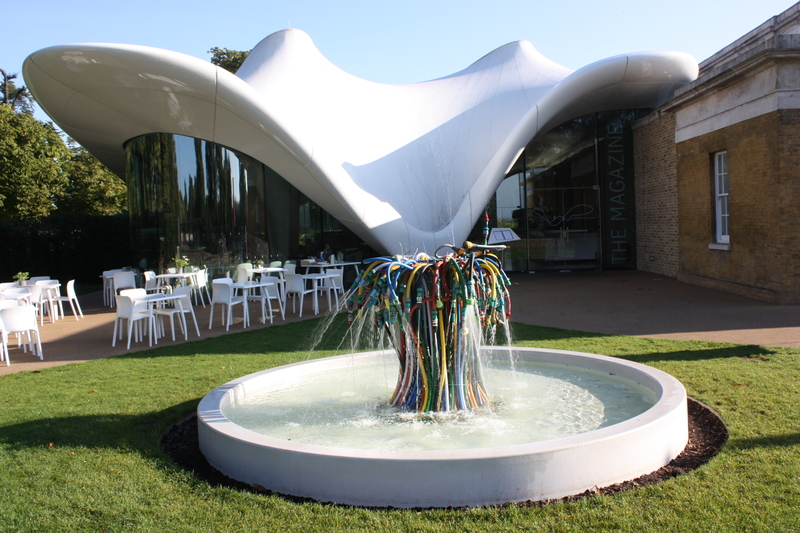 One of the few programs in Hyde Park is the Serpentine Gallery that commissions a pavilion every year by an emerging architectural practice. This years pavilion was designed by selgascano and I found the experimentation with structure and material interesting, but the final spatial and material experience disappointing. It felt to me a bit like a McDonald’s play place. Another building that I saw that was much more impressive was Zaha Hadid’s extension to the Serpentine Gallery that is in an old gunpowder storage building. I walked across to the park to the Northeast corner and made my way down Oxford Street, a shopping district that was just opening up for the day. My first surprise was to come across the Selfridge building. I had learned a bit of the history about the department store from a show my dad was watching on Netflix called Mr. Selfridge. The store first opened in 1909 and was the first building of it’s kind in London. The reason I was going down Oxford Street to begin with was to find my way to a cafe I had read about called the Attendant. 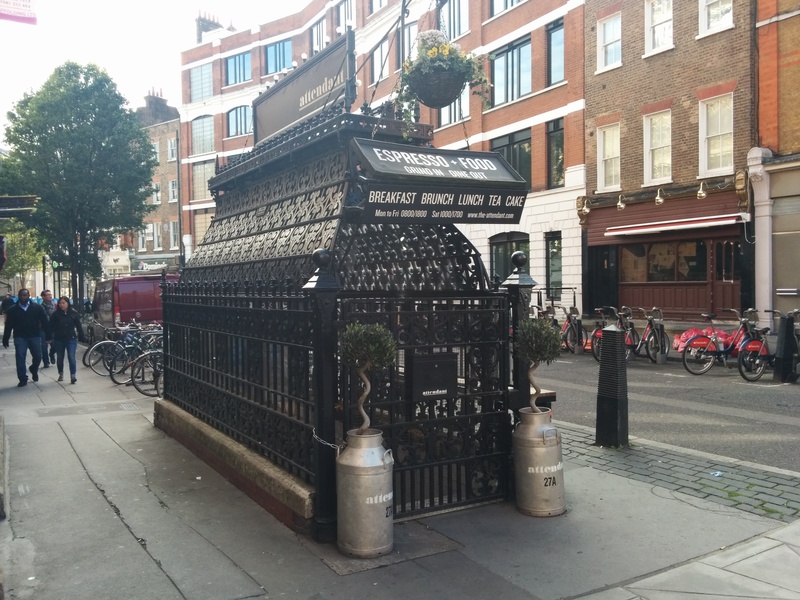 It was formerly a victorian underground toilet that was built in around 1890 and used until the 1960s. It sat vacant until it was transformed into this espresso and food place and still has the original tile, and urinals that have been made into a bar counter. I had gone all that way only to discover that it was closed! In fact everything I had seen that morning including the Serpentine gallery and department store had been closed either because it was too early or a Sunday. I learned my lesson not to venture out too early in London on a Sunday morning. I definitely want to come back to this place at some point to see what it looks like on the inside! I enjoyed brunch and a latte at a cafe down the road instead. Next I doubled back and headed down Regent Street to the Piccadilly Circus. And what a regal street it was! I felt like I was in a Jane Austin novel if you subtracted the bustling traffic! From there I went to Buckingham palace. For the first time that day I joined the throng of tourists. 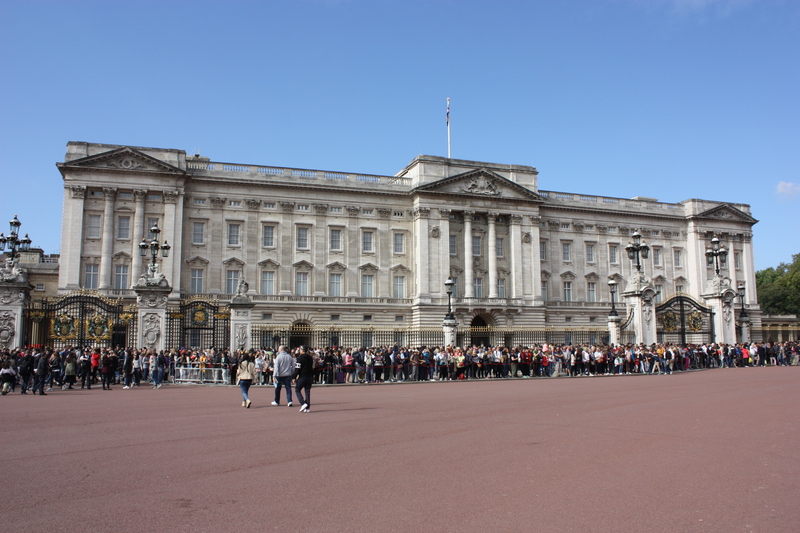 I hadn’t planned it, but I had arrived right on time to see the changing of the guard…. or rather watching the guards walk in and the other set of guards walk out. What a bizarre logistical exercise! I found it a bit anticlimactic but fun to get swept up in the public excitement. What I liked even more than the building itself was the park space along the mall with full grown trees and folding lounge chairs. Now that I had hit central London and was close to the Thames, it was time to see the big sights. Nearby to Buckingham palace was Parliament square, the Palace of Westminster, the Big Ben and the London Eye. The clock struck noon while I was there and it made me think how the last time I was there the clock struck midnight. Since half my day was over, this is where I’m going to abruptly end the post and finish up my story in a second post. What can I say; it was a long and eventful day! The rest of the conference flew by. 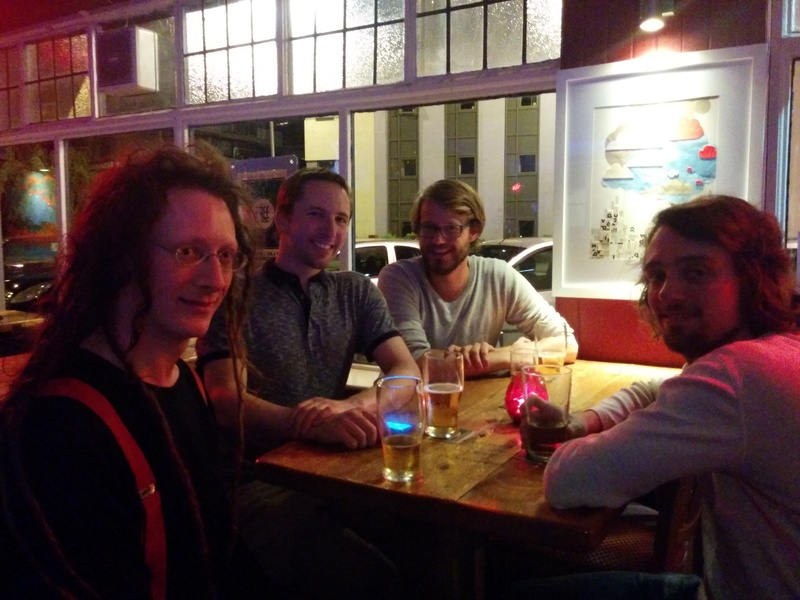 Thursday was particularly memorable because I went on a spontaneous pub crawl with some couch surfers and conference attendees. How it happened was that a guy named Chris who I had asked to host me couldn’t because he was hosting other people. He invited me to a meetup at a local bar called the Old Firehouse on the Thursday night. Then I proceeded to invite another CS host, Henry, who had turned me down and the guy he was hosting named Adrien from France. What was even more ironic was that Adrien had attended my panel the day before and I remembered him because he had asked a question at the end of my presentation. The following day he approached me between sessions and asked if I was the one his host had turned down! I guess it helps to have a first name with such unique spelling! Because I had met Adrien beforehand, it was easy to find him and Henry at the Old Firehouse pub that evening. I wasn’t sure if we would find Chris and his surfers because all I was going off of was a profile picture. But while I was sipping a delicious local cider (yum!) and talking to some people, I saw a guy behind them looking my way now and again. Low and behold it was Chris and the two girls he was hosting who were conference attendees from Spain. He had also invited another guy named Sanders from the Netherlands who he also had to turn down and who I had incidentally met a few days earlier at the hostel. Alice was unable to join because she is a nurse and had to work late. We were all famished and one of the girls was really feeling like curry and so we all headed off to a little Indian restaurant. It was nice because the restaurant was almost empty and so we could take a large table and sit and have all sorts of conversation. After a delicious meal we went to another pub called Duke of York because apparently there was some live music. This pub for some reason closed early and so off we went again to a pub called Sorry Head. We had a blast! I’m so glad that I couch surfed on this trip even though ironically it was the folks who turned me down that I ended up having such a good time with! I enjoyed the conference and my stay in Exeter. On Saturday morning I made the half hour walk with my big backpack to the Quay where I met Sanders for coffee and then walked around a quaint little market. 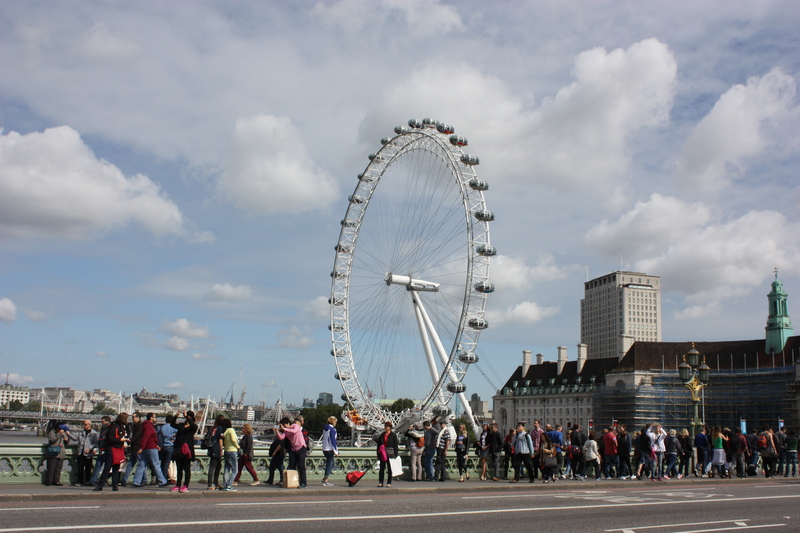 Then I made the half hour walk to the train station and was off back to London, this time to play tourist for a day! 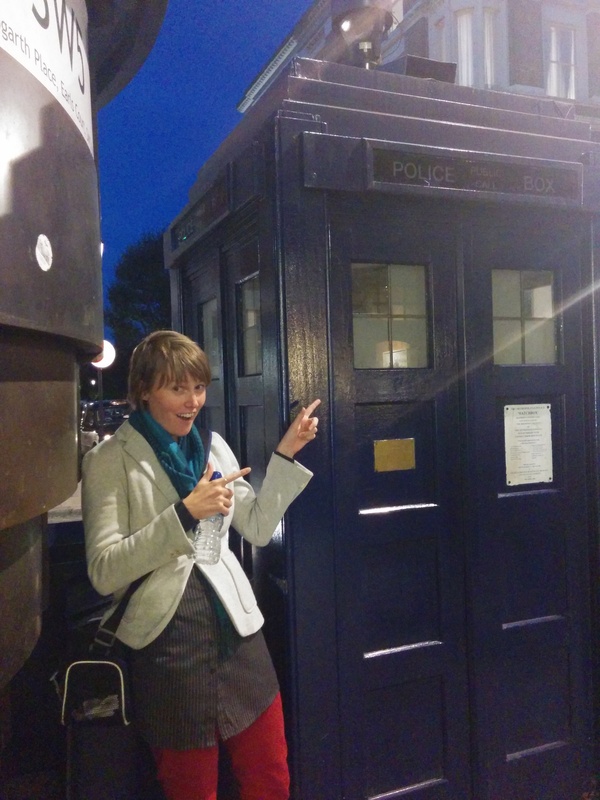 This post is coming a bit late, but it continues to describe my time in the UK for the conference this past September! The conference began full swing the following day. I was slightly distracted thinking about my own presentation that I would be giving later that afternoon. One interesting session that I went to was called “World Game”. I knew it would interest me because I was inspired in my thesis research by the work of architect and theorist Buckminster Fuller who came up with the concept of the World Game. Fuller proposed the idea of a game that could simulate events in real time and therefore drive political decision-making and bring about global action. The World Game session at the conference was lead by Anthony Hodgson who is the founder of Decision Integrity, a company that facilitates complex decision-making by applying strategies of holistic thinking, system mapping, and participatory group activities. His game is inspired by tribal “wisdom councils” where elders responsible for specific aspects of a community meet with the chief and he listens to them one by one. The attendees for the session were divided into twelve different world issues such as governance, health, and habitat (I represented trade), and we were provided with assigned “indicators” giving key information for each. 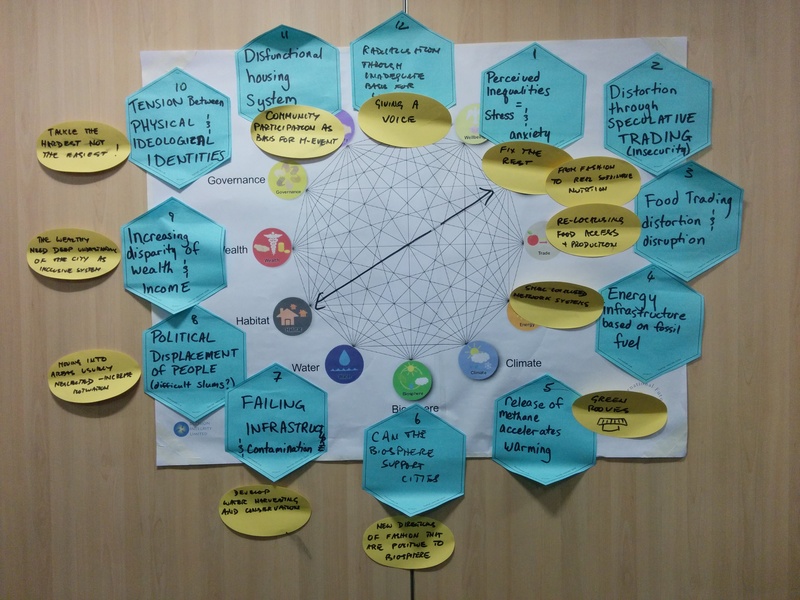 We were then placed into groups of four and played out several scenarios for which we had to identify the problems for each issue and come up with creative solutions that benefited all four issues. It was an interesting way to incite creative problem solving and discussion. Here is a similar version of the game that was applied to the city of Glascow. Because there were many people at this session who were interested in system mapping, I discovered that there is a program called Powersim that maps/diagrams complex, non-linear decision paths so that companies can understand the ramifications/big picture before proceeding with a project. The program reminds me of Grasshopper (algorithmic modeling for Rhinosceros) except that is is for general decision paths and equations instead of equations that manipulate digital 3D geometries. It’s the same general idea that you can simulate the path before actually going ahead and “baking” the best recipe. Mapping will definitely begin to use more complex simulation models as we use it to monitor resources and make future proposals/predictions for our growing cities. I had my presentation later that afternoon and it went very well! The panel was called GIS and the Anthropocene, Educational Perspectives. Our presentation was called “BeniAtlas: A platform for learning about the city” and it outlined the methodologies that IRI is using in the development of their mapping program, and introduced the Sharing the Land project that has developed from the initial research. Othy and Archip were able to listen in over Skype. After the presentation there was a reception and I talked for a while with the other people from our panel and received really great feedback. I had to leave early though to meet Alice who would be my couch surfing host for the next three nights. She and her boyfriend and another friend picked me up from the Imperial Pub near the university. At her apartment we had home-made ramen and watched Tales from Earthsea, a Studio Ghibli film. I slept on the couch in Alice’s living room and had the company of her three cats!